kCFRunLoopDefaultMode (Core Foundation) The default mode is the one used for most operations. Most of the time, you should use this mode to start your run loop and configure your input sources. Connection NSConnectionReplyMode(Cocoa) Cocoa uses this mode in conjunction with NSConnection objects to monitor replies. You should rarely need to use this mode yourself. Modal NSModalPanelRunLoopMode(Cocoa) Cocoa uses this mode to identify events intended for modal panels. Event tracking NSEventTrackingRunLoopMode(Cocoa) Cocoa uses this mode to restrict incoming events during mouse-dragging loops and other sorts of user interface tracking loops. kCFRunLoopCommonModes (Core Foundation) This is a configurable group of commonly used modes. Associating an input source with this mode also associates it with each of the modes in the group. For Cocoa applications, this set includes the default, modal, and event tracking modes by default. Core Foundation includes just the default mode initially. You can add custom modes to the set using the CFRunLoopAddCommonMode function. Defining a Custom Input Source. 和 CFRunLoopSource Reference. 更多信息请参考 Configuring Timer Sources. 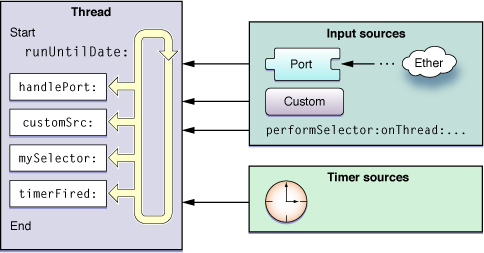 NSTimer Class Reference 和 CFRunLoopTimer Reference. 更多信息请参考 Configuring the Run Loop. 和 CFRunLoopObserver Reference.